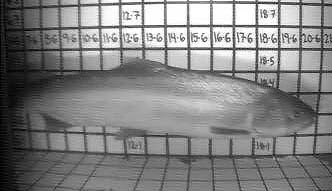 Saturday March 21, 2010: Casitas Municipal Water District reported the first documented adult steelhead of the season. Two adult steelhead were photographed passing through the Robles Diversion fish passage facilities; the fish were preliminarily estimated to be a 62 and 58 cm (24 and 23 inches) in length, and appear to be relatively fresh from the ocean. Here are two photos taken from the video clips, and one of the videos. This does not mean these are the first or only fish to have made their way upstream, but these are the first pictures. At a board meeting earlier this year, CMWD biologists described the limitations of the camera detection system installed in the fish ladder. 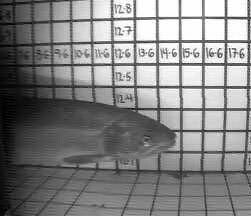 They have done experiments that show that the cameras cannot detect fish when the river is turbid (murky) - which happens to be any time the flows are high, and very often when fish are on the move.